Caterpillar Host Plants: Cratoxylum cochinchinense (Hypericaceae, common name: Yellow Cow Wood), Cratoxylum pruriflorum (Hypericaceae). 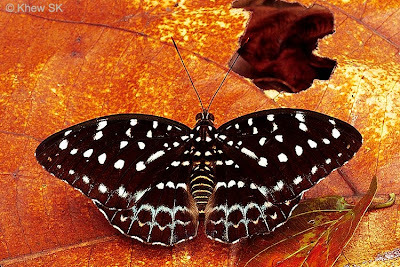 A male Archduke perching on a leaf on the side of a forest trail. A male Archduke displaying its wing upperside. 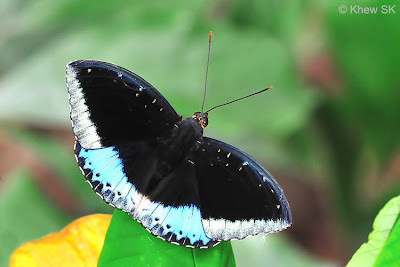 Above, the male is dark velvety black above with a broad greenish-blue distal border on the hindwing, which is continued narrowly along the termen of the forewing. 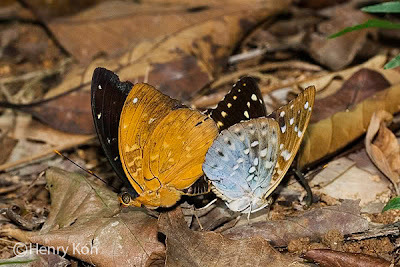 The larger female is dark brown, and profusely spotted with yellow. Underneath, the male is deep ochreous brown with yellow spots. The female is dark brown on the forewing and pale grayish green on the hindwing; with both wings spotted with white. 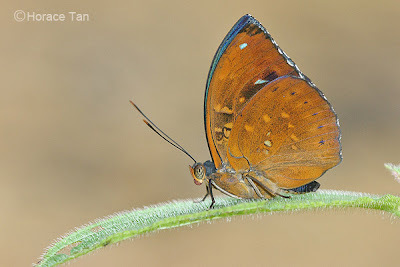 The apical portion of the antennal club is orange in both sexes. 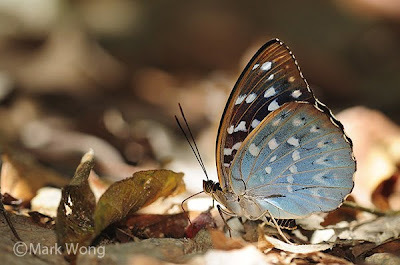 A female Archduke found feeding among leaf litter in the nature reserve. The Archduke is relatively common in the nature reserves. Adults are typically sighted on shaded trails and among undergrowth, and are seldom seen in open sunny areas. It is mainly a forest dweller and adults are often seen puddling on damp ground, or feeding on rotting fruits and other organic matter amongst forest litter. 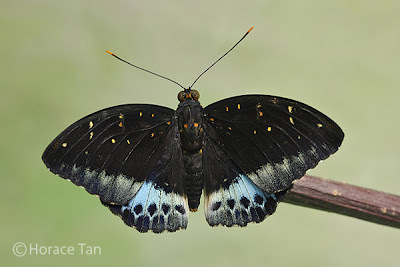 Refer to this earlier ButterflyCircle's blog article for a more detailed write-up on this species. The host plant, Cratoxylum cochinchinense, can be found growing naturally in the nature reserves and planted as wayside trees in various urban parks. 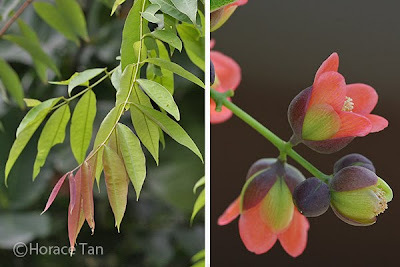 It has simple and opposite leaves which are red to dark red when young. Its red bark can peel off in strips or angular pieces. The bisexual flowers are pinkish to darker red. Besides Archduke, this plant is also utilized by Short Banded Sailor and Common Grass Yellow as larval food plant. Caterpillars of Archduke feed on older and more mature leaves of this plant. Host plant : Cratoxylum cochinchinense Leaves (left) and flowers (right). A mating pair of the Archduke on forest ground. 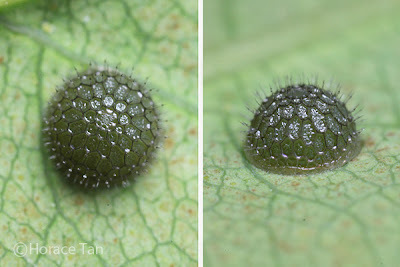 The eggs are laid singly on the underside of a leaf of the host plant. Each egg is dome-shaped with a base diameter of about 1.8mm. The surface is covered with large irregular hexagonal depressions with hair-like protuberances emerging from adjoining corners. The tip of each "hair" carries a tiny fluid droplet. The color is initially dark green but turns purplish brown on day 2. Two views of an egg of the Archduke on day 1. Two views of an egg of the Archduke, one day prior to hatching. After about 4 days, the 1st instar caterpillar emerges and proceeds to eat the eggshell as its first meal. 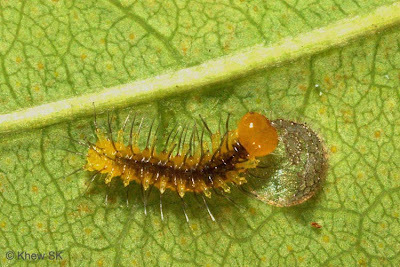 The caterpillar is yellowish orange in body colour and has a head capsule in darker shade of yellowish-orange. Its body sports ten pairs of short dorso-lateral protuberances complete with long black setae. Frass pellets are usually seen attached to the tip of these setae in this instar. 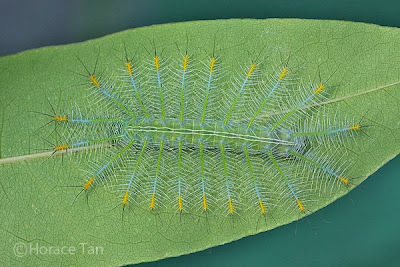 The caterpillar grows from an initial length of about 2.5mm to 7mm in three days. The subsequent moult takes it to the 2nd instar. Newly hatched 1st instar caterpillar eating its own egg shell, length: 2.5mm. 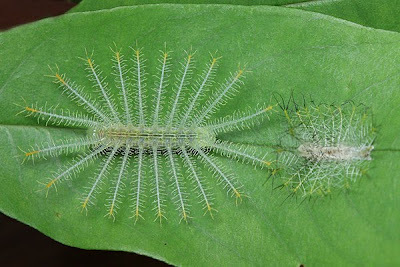 The moulting event of an Archduke caterpillar from 1st to 2nd instar at 6x speed. 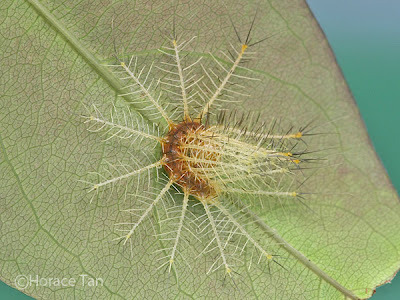 The 3rd instar caterpillar is still orangy brown in body color. The protuberances have all become much longer in proportion. The branched spines appear almost like a bird's feather, with the secondary spines arranged neatly around the main spine. The tip section of the main spine is colored in brighter shade of yellow compared to the rest of the protuberance. Dorsally there are two long and thin bands, in much lighter shade of orangy brown. 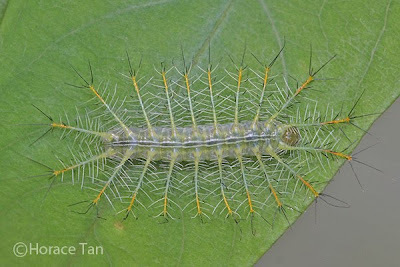 The 3rd instar lasts for 4-5 days and reaches a length of about 16-18mm before the next moult. 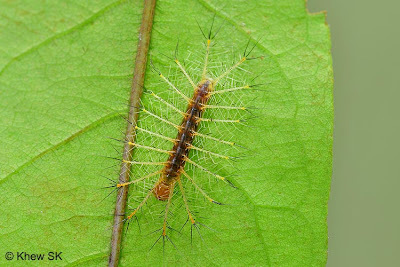 Towards the end of this instar, the body color gradually changes to pale yellowish green. 3rd instar caterpillar adopting an defensive stance, early in this stage. 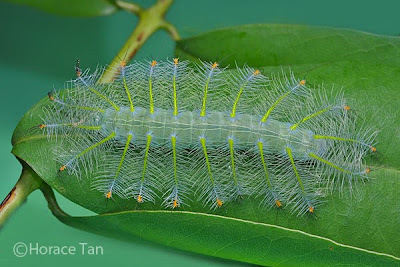 The 4th instar caterpillar has similar appearance as in the 3rd instar but with a pale yellowish green body color. Branched spines on each long protuberance are mostly pale green with just a few black in color scattered along its main axis. The few spines at the tip portion are all black. The distal portion of the protuberance is colored yellowish orange. As the caterpillar grows in this stage, the portion lying below this orange end will assume a strong bluish tone. On the body, the two dorsal lines are now more prominently marked, and are more constricted where adjacent body segments join. 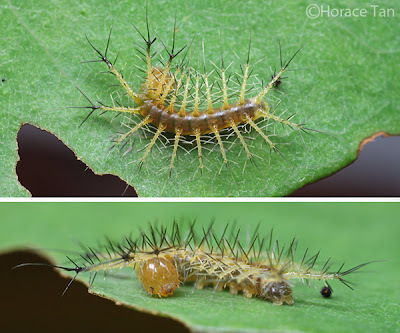 After 6-7 days in this instar, with its length reaching 28-30mm, the caterpillar moults to the 5th and final instar. 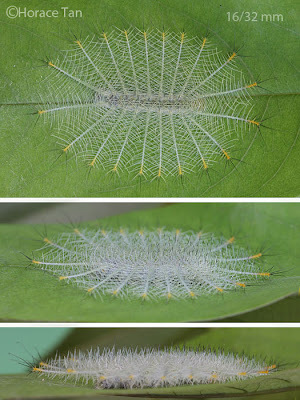 The moult from 4th to 5th instar of an Archduke caterpillar at 6x speed. Part 1/2: shedding the old skin. Part 2/2: inflating the new set of spines. 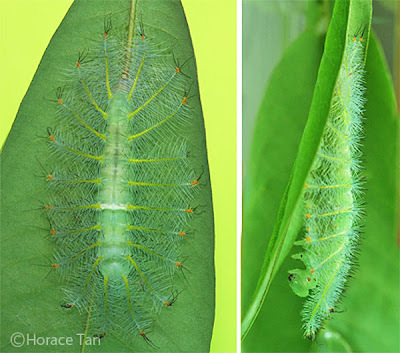 Essentially similar to the 4th instar caterpillar, the 5th instar features a brighter shade of green, especially so on the basal halves of the protuberances. It has also acquired a ferocious appetite, finishing one or two large leaves in a day. 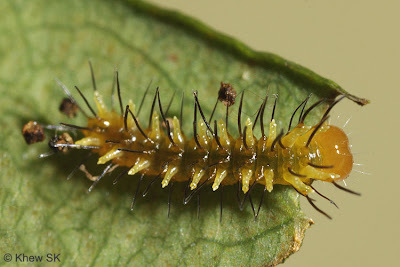 5th instar caterpillar, newly moulted. 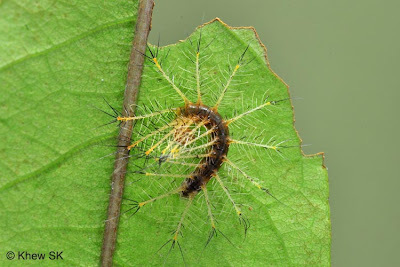 5th instar caterpillar, late in this stage, length: 49mm. 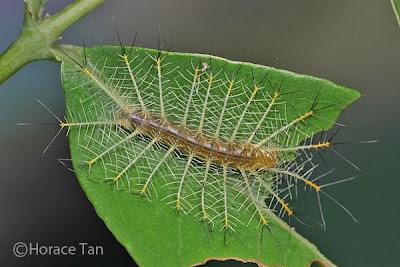 This final instar lasts for 8-9 days with the caterpillar reaching a mature length of about 50mm. On the last day, its body becomes shortened but hardly decolorized. It then seeks out a spot on the midrib on the underside of a mature leaf and stays put. 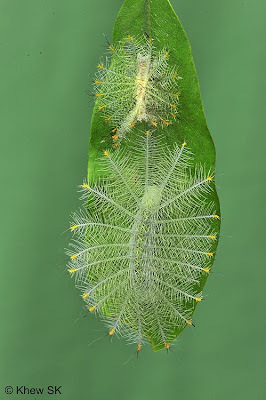 There it laboriously spins large quantity of silk threads to make a silk mound, to which its posterior claspers are then attached to, typically with pre-pupa in an upside down posture. The dorsal lines disappear at this juncture and a whitish saddle mark can be seen on the 2nd abdominal segment. 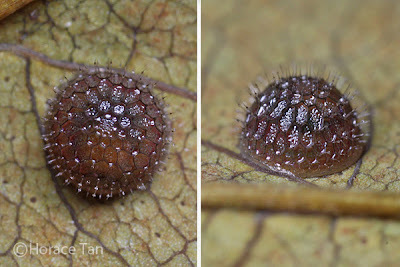 Two views of a pre-pupa of the Archduke. After 1 day of the pre-pupal stage, pupation takes place with the pupa suspended with its cremaster firmly attached to the silk mound on the midrib. The pupa is smooth and tapers steeply towards each end from a high transverse dorsal ridge which is lined with brown and a broader beige-colored transverse band. 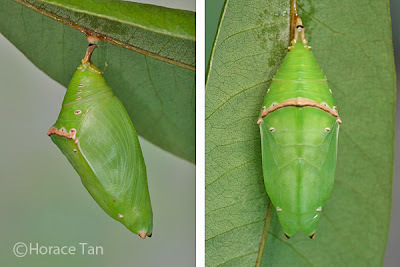 The light green pupa has a series of beige-colored spots symmetrically arranged. Two short cephalic horns, beige-colored with a brown patch, are also featured. Length of pupae: 26-28mm. The pupation event of an Archduke caterpillar at 8x speed. Two views of a pupa of the Archduke. 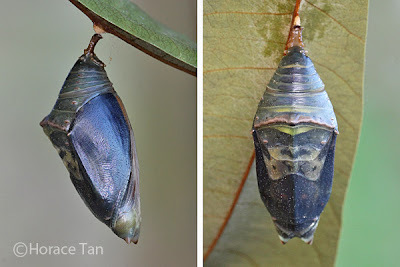 Ten days later, the pupa becomes considerably darkened, signaling the end of the development of the adult still encased within. 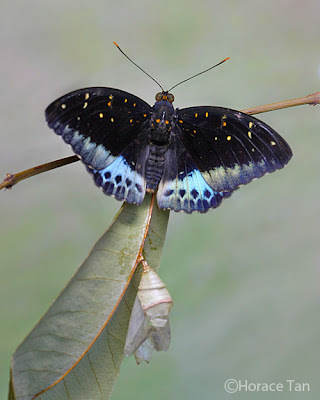 The next day, the adult butterfly ecloses and stays near the empty pupal case for an hour or two before taking off to continue its life circle. Two views of a mature pupa of the Archduke. A newly eclosed male Archduke resting near its empty pupal case.